For years data loggers have been too expensive and complicated for the weekend racer. But the DataMaxx has changed that with its cutting edge technology, user friendly software and 24/7 weekend tech support. When it comes to data loggers the software is what you use on a daily basis and if it's not easy to use and understand it's not worth your money. At Computech we focus on making our software as easy to use as possible while giving you all the information you need. Our software is the easiest to use on the market and the most powerful. 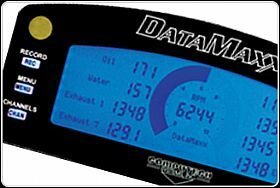 Racing with data loggers are now necessary to compete at the highest level whether your heads up racing or bracket racing. Heads up racers can gather valuable data that will help maximize every ounce of horsepower while monitoring your engines vitals to prevent costly engine damage. Bracket racers can finally identify variables that make the car inconsistent and maintain the optimal tune up to go those extra rounds. Regardless of what class your racing the DataMaxx can give you the knowledge and edge you need to win.